Go to the Mobile Banking app or to Online Banking to change choice category for future purchases once each calendar month, or make no changes and it stays the same. Unlimited 2 points for every $1 spent on travel and dining purchases. Unlimited 1.5 points for every $1 spent on all other purchases. 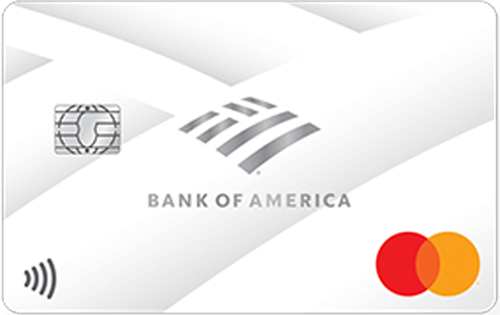 Redeem for cash back as a deposit into Bank of America® checking or savings accounts, for credit to eligible Merrill Edge® and Merrill Lynch® accounts including 529 accounts, as a statement credit to your credit card, or for gift cards and purchases at the Bank of America Travel Center. Get up to $100 in Airline Incidental Statement Credit and up to $100 in TSA Pre✓®/Global Entry Statement Credit. Ratings and reviews are voluntarily submitted by bank customers who have completed a customer feedback survey and are screened against moderation standards prior to publication. Ratings and reviews presented should not be interpreted as the opinions of all customers and are shared for informational purposes only. Not all bank products are included and depending upon your circumstances, there may be products which are more appropriate for you. Bank of America makes no guarantees about the accuracy and/or completeness of such reviews and assumes no liability for any actions taken in reliance upon such customer reviews. The numerical and visual star rating represents the average total number of accepted reviews per product based on a five star rating scale. The percentage of customers who would recommend the product to a friend represents the average number of “yes” responses to the survey question. Featured reviews are selected based on subjective criteria for marketing purposes. Bank of America reserves the right to remove published reviews at any time and at its discretion. Reviews were selected from all submitted reviews, as of 10/23/2018. †See Terms and Conditions for Cash Rewards card Link opens in a new window for rate, fee and other cost information. †See Terms and Conditions for Travel Rewards card Link opens in a new window for rate, fee and other cost information. †See Terms and Conditions for Premium Rewards® card Link opens in a new window for rate, fee and other cost information. †See Terms and Conditions for BankAmericard® card Link opens in a new window for rate, fee and other cost information. Your 3% choice category could go up to 5.25% cash back and the 2% at grocery stores and wholesale clubs could go up to 3.5% for the first $2,500 in combined choice category/grocery store/wholesale club purchases each quarter. The 1% for all other purchases could go up to 1.75%. Instead of earning an unlimited 1.5 points for every $1 you spend on all purchases everywhere, every time - you could get up to 2.62 points for each $1 you spend. You could earn up to 3.5 points for every $1 you spend on travel and dining purchases and up to 2.62 points for every $1 you spend on all other purchases. This card is not a part of the Preferred Rewards Program. 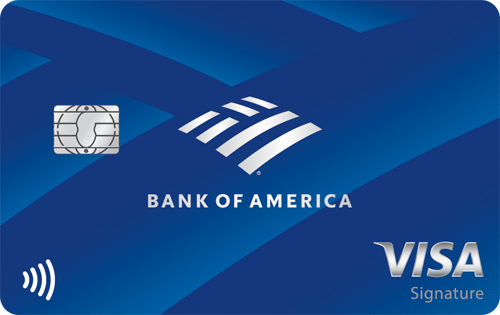 Credit card programs are issued and administered by Bank of America, N.A. Mastercard and World Mastercard are registered trademarks of Mastercard International Incorporated and are used by the issuer pursuant to license. Visa and Visa Signature are registered trademarks of Visa International Service Association and are used by the issuer pursuant to license from Visa U.S.A. Inc. 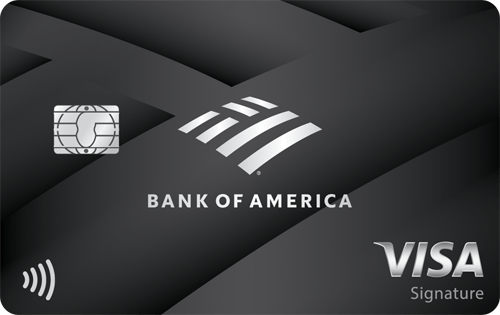 The Preferred Rewards logo, BankAmericard, Premium Rewards, Merrill Lynch, Merrill Edge, Bank of America and the Bank of America logo are registered trademarks of Bank of America Corporation. Airline Incidental Statement Credit. You are eligible for a statement credit of up to $100 each calendar year if you make qualifying airline incidental transactions. To qualify, you must use your Premium Rewards® credit card to pay all airline incidental transactions. Allow 7 days from qualifying for the statement credit to post to your account. You are responsible for payment of all charges until the statement credit posts to your account. Your account must be open and not in default at the time of statement credit fulfillment. Qualifying transactions are those purchases made on domestic-originated flights on certain U.S.-domestic airline carriers that include: preferred seating upgrades, ticket change/cancellation fees, checked baggage fees, in-flight entertainment, onboard food and beverage charges, and airport lounge fees affiliated with eligible airline carriers. Airline ticket purchases, mileage point purchases, mileage point transfer fees, gift cards, duty-free purchases, award tickets and fees incurred with airline alliance partners do not qualify. Airline incidental fee transactions must be separate from airline ticket charges.